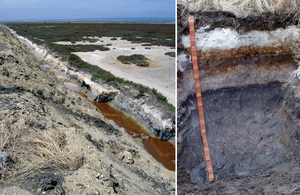 The picture on the right shows a bleached-sodic, Sulfuric, Hypersalic, Hydrosol soil profile near Gillman, South Australia. A seasonally wet, mottled yellow (jarosite-rich) sulfuric material in the major part of the B2 horizon with abundant white salt efflorescences overlying black sulfidic material. Bleached surface layers occur with gypsum and shell materials. Photographer : Rob Fitzpatrick on January 01 2002.